Today our paper on the development of a novel photomicroreactor for solar photochemistry was published in the ASAP section of Angewandte Chemie International Edition. We are very excited about this work and we would like to take you behind the scenes on how we conceived this idea, got the first results and finally made the required breakthrough that led to this publication. Since the start of my independent academic career in 2012, my group has been intrigued by visible light photoredox catalysis. Photoredox catalysis provides neat solutions for previously elusive organic transformations (broad scope, high functional group tolerability, mild reaction conditions). However, one of the biggest hurdles of this chemistry was its scalability and we have worked on continuous-flow microreactor solutions to overcome these challenges. One of the major selling points of photoredox catalysis is that – at least theoretically – sunlight can be used to drive these reactions forward. However, when scrolling through the photoredox literature (given its popularity, we can assure you this is a tremendous effort), sunlight was almost never used. And, when used, the reaction times became unrealistically long. We realized that continuous-flow microreactors could be beneficial here to ensure that the entire reaction mixture was irradiated equally. However, such flow reactors can only be useful when solar energy is abundant and focused towards the reactor (there is a recent review on this topic if you are interested in it). We are living in The Netherlands, not really the most sun-rich region on this planet, so forget it – this approach will only work on sunny, cloudless days but they are far too scarce! There is even more: typical photoredox catalysts can only absorb light in a narrow wavelength-window (typically around their absorption maximum), which means that only a small amount of the solar energy is harvested to enable the chemical conversion. So photoredox catalysis on its own can never be energy efficient. To address these issues, we looked at Nature’s tree leaf. It uses various antenna pigment molecules which allow harvesting solar energy. This harvested energy is subsequently transferred to the reaction center where CO2 and H2O are converted into sugars. So the question is, can we come up with a solution to mimic the behavior in the tree leaf? A potential solution came when I was discussing my idea with Michael Debije. He is one of the leading experts in so-called luminescent solar concentrators (LSC). When he showed me the material, we both had immediately the Eureka-feeling. Luminescent solar concentrators have been used in the past to improve the efficiency of photovoltaics. 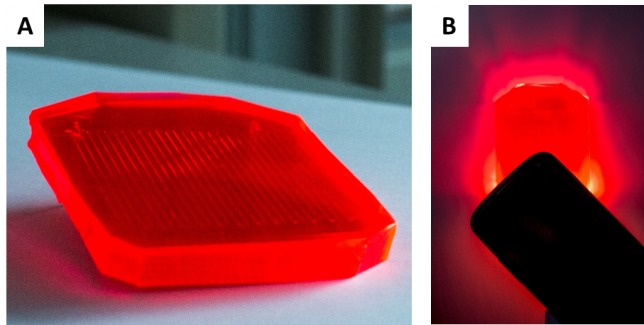 These polymeric plates contain fluorescent dyes which absorb the light and, due to internal reflection, the light is guided towards the edges. What is more, by changing the dye, you can also change the color of the polymeric material. So I believe you can already see where we are heading? The idea is to carve channels into this luminescent solar concentrator AND to match the emission of the embedded dye with the absorption maximum of the photocatalytic system flowing in the microchannels (Fig. 1). As such, at least in theory, we would be able to mimic the principle of the tree leaf. Fig.1. 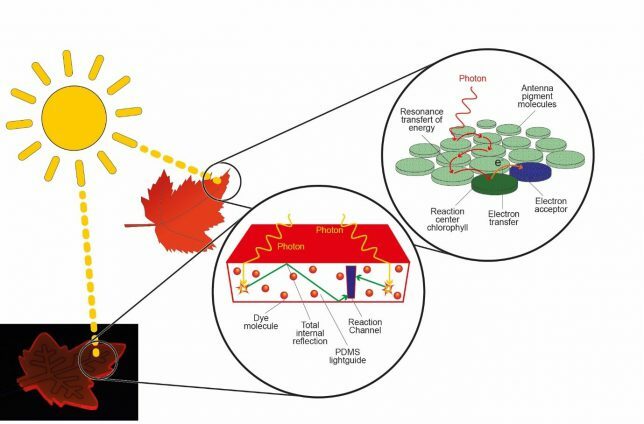 Comparison and analogy of solar harvesting and photon transfer in a leaf and in a LSC-based photomicroreactor. Note that the LSC Photomicroreactor leaf is a real device! Simple enough? Well theoretically yes, but then you need to find funding and that is nowadays not a walk in the park, especially for conceptually new ideas. About a year later, I was able to secure Marie Curie funding (Photo4Future) and I got a personal award (VIDI), which gave me sufficient cash to start the hiring of a Ph.D. student and a postdoc to do the experiments. In 2014, I had an interview with Dario Cambié and I was immediately convinced that he was the right person for the challenge. He had a pharmacist background but he was very broadly educated and was genuinely interested. So Dario came to Eindhoven and started to work on the project LSC-based photomicroreactors. While the project is fairly complicated (chemistry, material science, and engineering), we felt that we had assembled the right competencies to tackle this problem. The team selected rapidly Lumogen F Red 305 (LR 305) as the dye for the LSC and methylene blue as the photocatalyst. 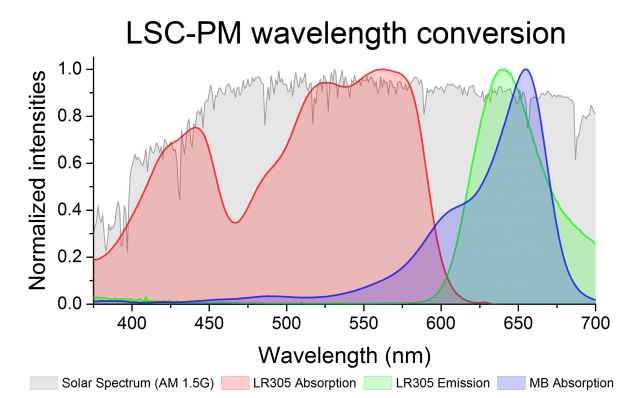 As you can see from Figure 2, LR 305 can absorb a broad range of wavelengths and re-emits light perfectly at the absorption of methylene blue. Dario set out to work and he found he could embed LR 305 into PDMS. This polymer material has been used quite a lot in microfluidics since it can be easily shaped with soft lithography and print-and-peel techniques. Already with the naked eye, we could see that the wave guiding was prominent at high dye-loadings. Just check the picture of one of our earliest prototypes, as soon as you shine light on it from a cell phone you see the red halo at the edges of the device (Fig. 3). Fig. 3. (A) One of the first prototypes of the LSC-photomicroreactor. Note the shining edges demonstrating the waveguiding potential of the device. (B) Using cell phone light results in a strong wavelength conversion as is evident by the red halo. However, when we tried these prototypes to the singlet oxygen-mediated [4+2] cycloaddition of 9,10-diphenylanthracene, the results were initially not that great. So we set out to do some Monte Carlo ray-tracing simulations to understand the fundamental phenomena which were operative in our LSC photomicroreactor (More details on this model will soon be reported in a separate manuscript). We rapidly found that the height of the channels was crucial. The higher the channel, the higher the chance that the waveguided photons were captured within the reaction channel (see figure). Indeed, we observed for the first time a significant rate enhancement compared to a normal photomicroreactor. At that point, Dr. Fang Zhao (a highly skilled chemical engineer) joined the team and we could increase our efforts to prove the efficacy of our device. In a series of fundamental experiments, we proved the light converting and the wave guiding ability of the device. Most of these experiments were carried out in the laboratory with LEDs or solar simulators. However, the real test for our device was an experiment outdoors on a normal day with quite some cloud coverage (see Figure 4a). Dario and Fang developed an ingenious experimental setup which allowed us to measure the conversion in both the LSC reactor and the normal non-doped version in real time. While we had some high expectations, the real data was even better than anticipated! The LSC-based system consistently showed higher conversion than the non-doped version, e.g. 40% higher yield for a residence time of 10s (see Figure 4b). However, and more importantly, the LSC photomicroreactor showed a very stable performance while the non-doped version was showing ups and downs in conversion. This can be very easy explained by the cloudy sky conditions. The LSC photomicroreactor allows harvesting both direct and diffuse light. The harvesting area of this device is quite large and once a photon falls on the device it will be converted and guided to the reaction channels. For a non-doped version, only light that falls directly on the channels will be used. Just to give you an idea, our LSC device harvests up to 7x more photons than the non-doped version. And we believe that with some further modifications we can go up to 10x better performance. The fact that our device also works under cloudy sky conditions indicates that it can be used in those countries which are not blessed with a sunny climate. Fig. 4. (A) A common cloudy summer day in The Netherlands. (B) Stable performance for the LSC photomicroreactor. Note that the dip in conversion is attributed to a large cloud, resulting in a drop in the light intensity. Now critical scientists might say that it is easier to use a photovoltaic and then use the current to power an LED strip of the right color. True this is an option but it requires a couple of energy transformations which means that you will lose a lot (Second Law of Thermodynamics). For the photovoltaic/LED option, we calculated a 2.5 % overall efficiency (from solar energy to chemical conversion). However, with our device, you can skip a few steps and we come to an overall efficiency of 10%. Before we forget, we can make this device essentially in any shape you want at almost no cost (material cost of our devices are below 1 euro). Our leaf design works as well as the normal square design. Moreover, the color makes it esthetically appealing and indeed such materials have been used in architecture, e.g. the Musac museum in Léon (Spain), the new biochemistry building at the University of Oxford (UK), and the Palais des congrès de Montréal (Canada). It would be cool to see the boring-greyish piping of chemical plants of today being replaced with our colorful, solar driven photochemical photoreactors. Both the nice color and the use of a sustainable energy source would help to alter the “negative” public image of the chemical industry. We hope that this design will find its way into solar-driven photochemical transformations. Currently, we are working on exploring the potential of this LSC photomicroreactor in wide series of different photocatalytic transformations powered by solar light. These results will be published in due course! So keep an eye on our website. 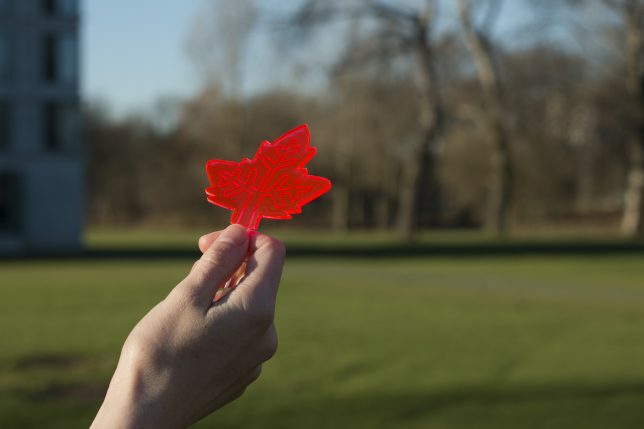 The paper discussed in this blog was published as: A leaf-inspired luminescent solar concentrator for energy efficient continuous-flow photochemistry. D. Cambie, F. Zhao, V. Hessel, M. G. Debije, T. Noël, Angew. Chem. Int. Ed. DOI: 10.1002/anie.201611101 (VIP publication). D. Cambie, C. Bottecchia, N. J. W. Straathof, V. Hessel, T. Noël, Chem. Rev. 2016, 116, 10276-10341. D. M. Schultz, T. P. Yoon, Science 2014, 343, 1239176. M. Oelgemoeller, Chem. Rev. 2016, 116, 9664-9682. M. G. Debije, P. P. C. Verbunt, Adv. Energy Mater. 2012, 2, 12-35. Photochemical Processes in Continuous-Flow Reactors available for preorders!